Fisher Labs is proud to introduce their newest offering the “Gold Bug". 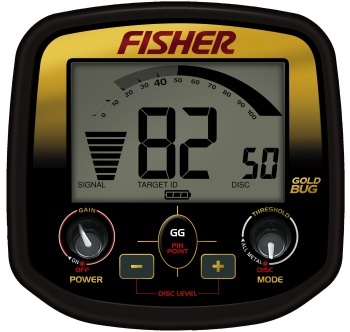 The engineers at Fisher have been busy designing one of the most sensitive new gold detectors to ever be offered by Fisher and at a very affordable price. Don’t let its diminutive size fool you because it will find the smallest gold nuggets in highly mineralized soils! Let’s face it, most dug nuggets at the shallower depths will be smaller in size for the most part and this is where this little gem will show its best sensitivity! It’s small 5 inch DD search coil will effectively cancel out most ground conditions and the prospector can monitor the ground phase and ground mineralization. Computerized to give optimum results in all soils! We are an authorized Fisher Metal Detector Dealer with over 8 years of enjoying this hobby. We don't just sale them, we use them. Need help deciding - Email or Call us with any questions about the products.